After hitting .284 and putting up a .824 on-base plus slugging (OPS) for rookie level Elizabethton in 2017, Miranda was one of several highly-regarded hitting prospects that were expected to power the Kernels’ offense in 2018, but the 19-year-old from Puerto Rico managed just a .180 batting average in 16 April games for the Kernels before the calendar mercifully turned to May. Since then, however, Miranda has not only been hitting at a respectable .262 rate, but has six doubles, a triple and four home runs among his 40 post-April hits. Being younger than almost all of the pitchers he was facing would be enough of a factor to explain the slow start with the bat, but Miranda had one more thing going against him that many of his teammates didn’t. Unlike some players who spent their high school and/or college days playing ball in the northern areas of the United States, playing baseball in the cold was a new experience for Miranda. He’s reluctant to blame his slow start on the weather, but facts are facts. As the temperatures have been rising in Iowa and the surrounding area, so has Miranda’s stat line. Kernels hitting coach Brian Dinkelman thinks the weather had something to do with the infielder’s sluggish start to the season, as well. Miranda, himself, admits he has an affinity for taking a good whack at the first pitch. Even so, his aggressive approach hasn’t led to a ton of strikeouts. Through his first 213 at-bats, he’s K’d only 31 times. “Yeah, I like to battle,” Miranda explained. “Sometimes when I see a first pitch is right down the middle, I just like to swing. Take advantage of it, because sometimes it’s the best pitch you’re going to see. Maybe the first pitch is right down the middle, a fastball, then they’re going to work you with different pitches, so I like to jump at that first pitch. But if I don’t get it, then I’m going to keep battling. Miranda has had plenty of talented hitters to watch and learn from in Cedar Rapids this season. “We’ve got a first overall here, Royce (Lewis), and other guys that are first-rounders, second-rounders,” Miranda pointed out. “It doesn’t matter if they’re like first 10 rounds, all the guys are super important for me, too. It’s pretty cool to play with these guys. Miranda says he’s also feeling stronger as the season progresses. Miranda said he’s been playing baseball since he was four years old. “When I was little I used to play in my back yard. Everybody came to my house,” he recalled. He was a shortstop through his high school playing days, but at the time he was drafted, scouts reportedly projected him to end up filling out and moving to third base. 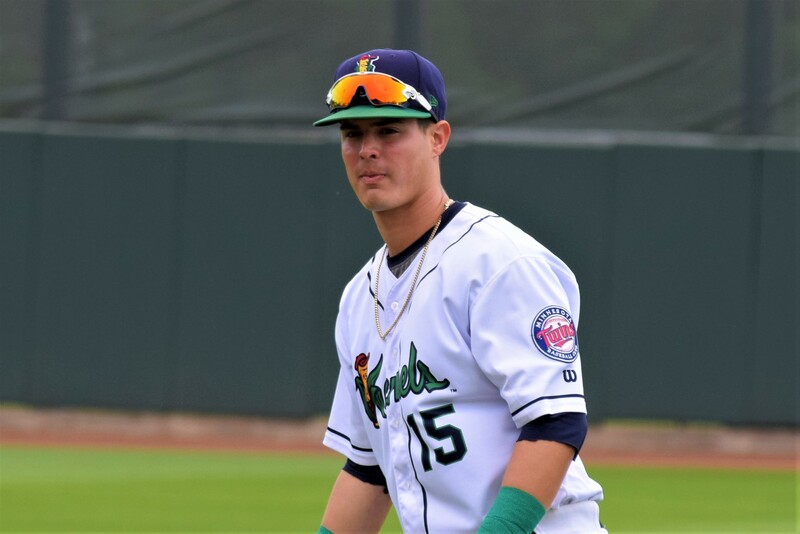 He played almost exclusively at second base in Elizabethton a season ago, however, and seemed to be set there through most of the first couple months of the Kernels season, while 2017 fifth-round selection Andrew Bechtold was manning third base. In recent weeks, however, manager Toby Gardenhire has often swapped the two, giving Miranda time at third base, with Bechtold at second, while Lewis continues to hold down shortstop and Jordan Gore gets a lot of work in a utility role, filling in at all three positions. Dinkelman acknowledged the change in pattern, but cautioned about reading too much into it. As for Miranda, he’s open to playing wherever the team and it’s leadership need him to play. With the 2018 draft taking place early this month, Miranda was recalling what it felt like to go through the draft process two years ago, as a 17-year-old in Puerto Rico. Is this article about a player who has been batting .262 for 5 weeks in low A? Did I miss something? Excellent article, Steve!Good to see Jose start to crank it up. Speaking of slow starts in cold weather - do you recall how Byron Buxton hit in Cedar Rapids at the start of the season?I've always thought the weather was a part of Buck's slow starts in the majors...he's not really a cold weather player it seems. BTW, another Kernel starting to heat up....3B Andrew Bechtold. He's not yet 20, and his April was markedly worse than his May and (so far) June. He has a chance. In addition, the article lets you get to know a little about the player behind the stats. If that's not your cup of tea, so be it. I am happy Miranda is turning it around. He was one of my favorite players in Elizabethton. Loved the power stroke there. Was hoping for a faster start from him but he is young. Just glad the Twins are challenging the young hitters early. I think it will pay off in the long run. Just start calling it bading average. If that's the only thing you're looking at, yes, you are missing something. If this makes you feel any better, here's his batting line from May 9 on, a sample of 133 PAs: .292/.361/.458. Well there goes my theory on Buck out of the gate in April! Although, like you said, it could have been really warm back then. Yes. It's an interesting story about a young prospect with ability and potential with the system. A thousand apologies to all. This recent Twins downturn has gotten me to take a turn to Negative Town.Seeing Grossman and Adhireza playing everyday has me scouring the minors for help immediately. It was a good article. And thanks for answering the question I had as I started reading.That is how the Kernel's were handling having two third basemen,Miranda and Bechtold, on the same team.Any chance one of them gets moved up to Fort Myers? Adrianza has recently been help for seeing Adrianza playing every day, if you've bothered to watch the past week of games.Do I think it will last? No, but Polanco will back by then, and Adrianza will be back in the role where he does provide value. both Adrianza and Grossman are putting up the same power numbers as last year and walk rates are similar too.The only thing dragging these two numbers down from last year is about 30 to 50 points in their batting averages. Yeah, I'd agree with Seth. Miranda and Bechtold are both athletic and have been making much better contact with the bat, but they'd have to really step it up to get themselves included in promotion discussions. Bechtold, at 22, is a bit older, of course, so if either one was going to get pushed (say, in the event of injuries to infielders at higher levels), I suspect he'd be the one. Thanks SD! Nice article. What I saw of Miranda when I was down there last week left me with very high hopes as well. He definitely looked the part as a prospect... Not one of the top three prospects there but in the discussion of top 5 CR prospects. I also thank Mr. Buhr for a good read. Bechtold is having his share of difficulty in Cedar Rapids: .199 BA, .521 OPS. At 22 you'd like to see him move up before the 19 year old, but they both look in need of more time at low A.